Scott Free (Mister Miracle) and Big Barda are struggling to decide whether to surrender their son to Darkseid in exchange for peace between Apocalypse and New Genesis. Well, only Scott Free is confused about the right course of action. Big Barda will not hear anything of it. How will they manoeuvre around Darkseid’s insidious plan for their family? 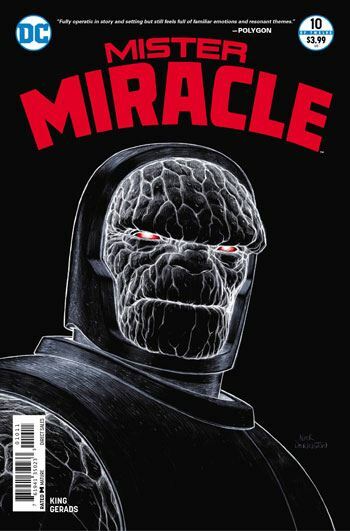 The cover of Mister Miracle #10 is the first time that we see Darkseid in this comic. Even within the pages of the comic he remains visually absent, but his presence is felt more than ever. This is how threatening he has been since the series started. This depiction of Darkseid is probably one of the best even though we have not really seen him. To read this comic means paying attention to many things that are evoked visually of vaguely alluded and then tying all the random points together. For example, the Anti-Life Equation is mentioned but not much more. Next, Tom King makes fun of Stan Lee by using a character Jack Kirby had created for that function. Just in case it was not clear for some readers, Funky Flashman is Stan Lee. It appears that Jacob, Scott Free’s son may even be Jack Kirby. King brings some of Mister Miracle’s old friends from the Justice League. What I find interesting is that this assumes that the Pre-52 continuity where Blue Beetle and Booster Gold were members of the League with Mister Miracle is intact. I do not believe that the three of them have been members of the Justice League together since 1989. If you read Batman, pay attention to Skeets. Skeets is important when he appears in the work of Tom King. 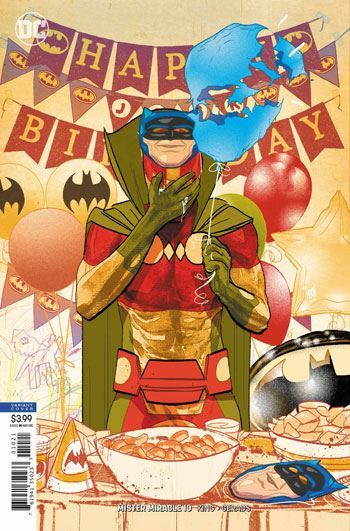 Mitch Gerads has a lot of fun this issue. It may be false positive but Scott Free sports various T-shirts from members of the Justice League and even one of the Sheriff of Babylon! None of this may have any meanings but it’s fun to see. I recently compared Gerads’ nine-panel grid with Gary Frank’s. 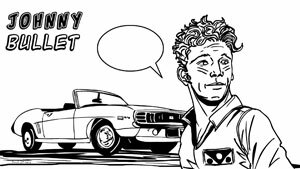 While Frank focuses subject-to-subject transitions, Gerads’ uses many repetitions and moment-to-moment transitions. Even though the nine-panel grid has become a fetish and stylistic trick to mark authoritative comic book authorship instead of the genuine, each artist still manages to use it in unique ways.